I keep telling myself that I am going to post here on a regular basis again, because it is something that I really enjoy doing. And while I am not a great writer by any means, at least when I write here, it makes me think about my words a little more and I think that's good for me. But then weeks go by and there just isn't the time. Anywhere, here I am now and I am going to share some iPhone pictures that I took two weeks ago when I went on a little day trip to some parts outside of Santa Fe. I had hoped to stop and take lots of pictures along the way, but sometimes things don't work out quite the way we planned. My original thought was to drive out to Madrid and hang out there. I headed out on Highway 14, also know as the Turquoise Trail. Once I reached Madrid and drove through the tiny town, I realized it wasn't really where I wanted to be. A nifty place for sure, but I wasn't feeling it. So I turned around and went to Cerrillos instead. I was rather enjoying just driving around so I wasn't sure what I really wanted to do. Then I saw signs for a turquoise mine museum/petting zoo/trading post. How could I possibly resist that attraction? 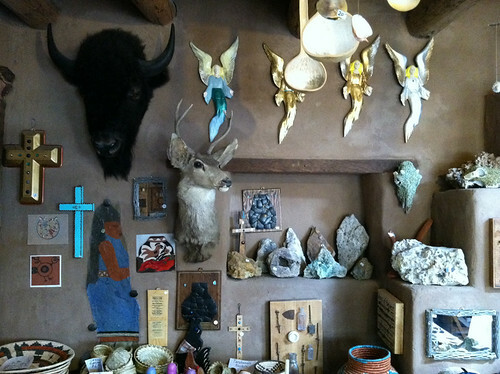 I followed all the arrows and ended up at the Casa Grande Trading Post, Cerrillos Turquoise Mining Museum & Petting Zoo. It's a crazy, lovely place filled with tons and tons and tons of stuff. Every kind of rock and crystal that you can imagine. 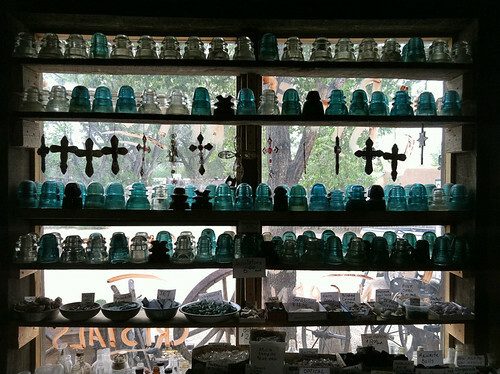 Cheap turquoise trinkets. 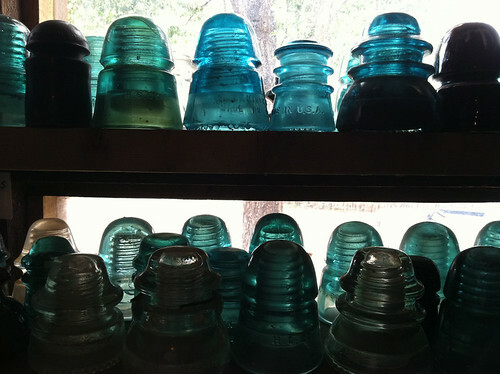 Windows lined with old bottles and insulators. A completely random selection of postcards. Dream catchers. Just everything. And that's just the Trading Post. 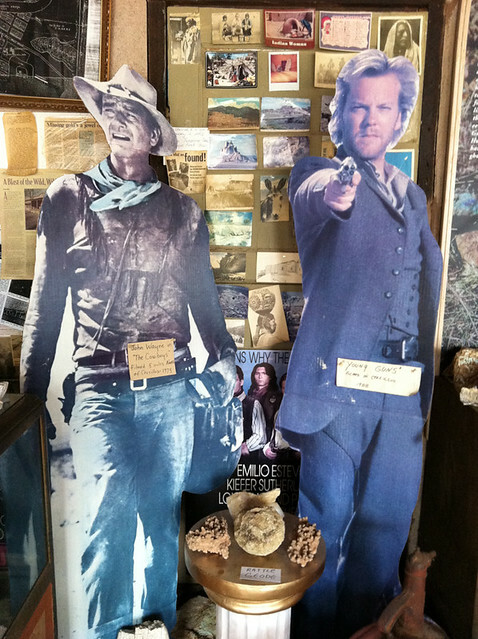 Beyond the second room of the trading post, there is the museum which costs two dollars to enter. 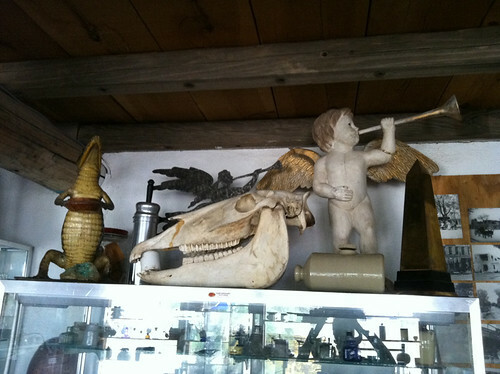 It is filled with an incredible amount of someone's beloved collections and totally random junk. And by junk, I mean lovely junk, but still junk. 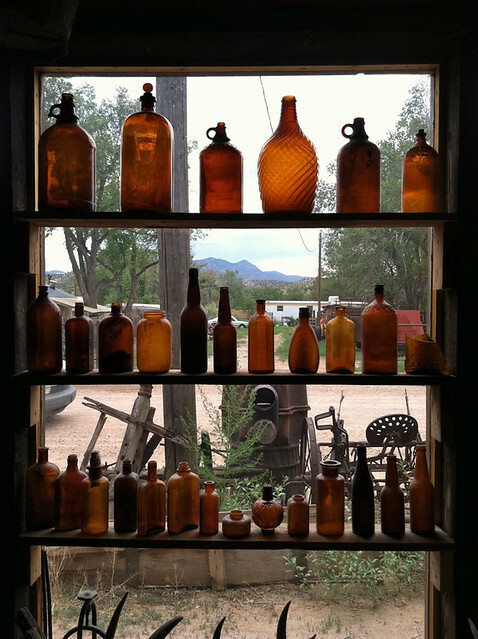 And a lot of crazy, old antiques and more old bottles and insulators and mannequins and then more rocks and crystals. 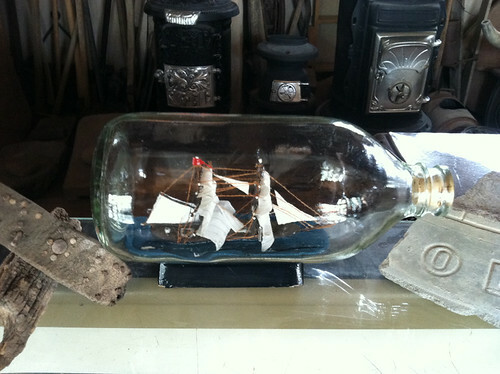 Oh and skulls and cardboard cut-outs and a ship in a bottle. It was mind-boggling and amazing. I was delighted to have stumbled upon this place. 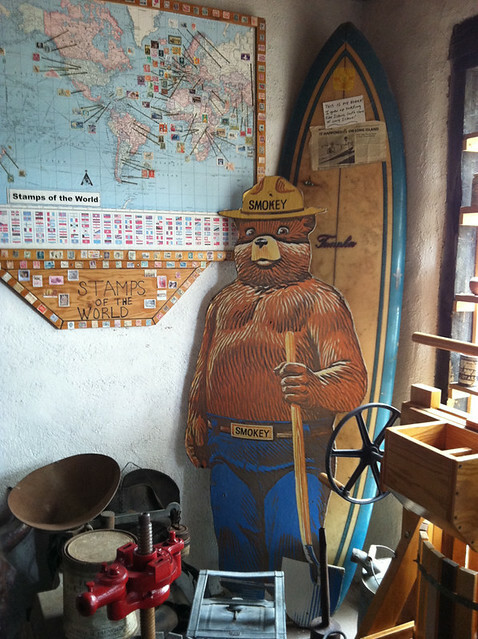 Smokey AND a surf board. Go figure. There was a helicopter flying overhead the whole time I was out there and as I was buying a couple of postcards, one of the owners started telling me how this time of year, there are always low flying helicopters flying around, looking for weed crops. He said, "yeah, that's how everyone makes a living out here, growing weed." 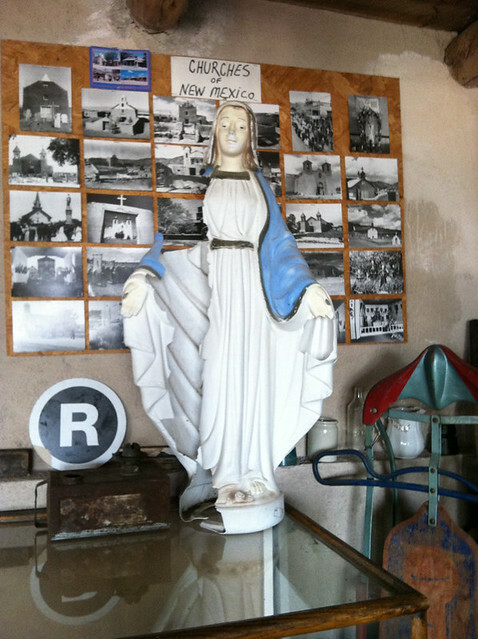 On my way back to Santa Fe, I decided to drive through Galisteo just because I was enjoying driving around. There was a storm coming and the lightning was pretty awesome to see in the distance. It's so beautiful here in New Mexico and I really don't take the time to get out of Santa Fe often enough. In Galisteo, I came to a "T" intersection and decided to go right since there was no signage to tell me which way I should go to get back to Santa Fe. Of course, almost immediately upon turning, I realized I was going the wrong way and in fact, I had no idea where I was going if I were to keep going that way. (I would have ended up hitting I-40 near Moriarty.) All I had to do was turn around, but it was a two-lane highway and there were absolutely no pull-outs for miles and miles. So I just kept driving and driving in the wrong direction. I was vaguely distressed, but not really, and it was so incredibly green out that way. I could hardly believe it. I took a lot of pictures in my head while I was driving and that was good enough for me. I was finally able to turn around and made it back to Santa Fe without a hitch. All in all it was a pretty awesome day and I really need to do things like that more often. that broken virgin is super creepy! it looks like she is manifesting out of the pictures. That sounds like such a fun little adventure! I can be really shy about getting out on my own but find that when I do I always have a great time! 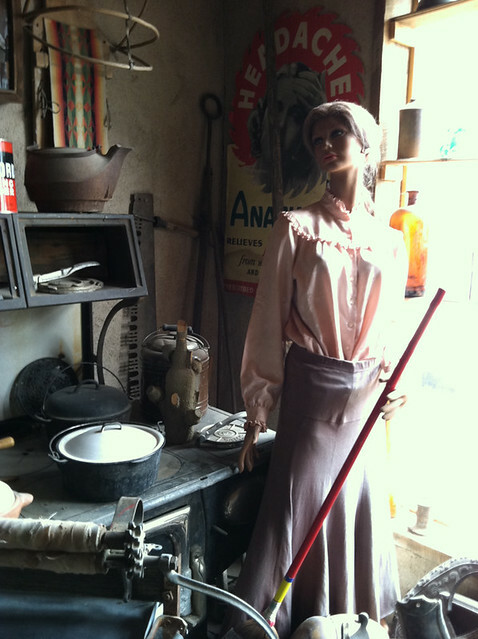 This museum you stumbled upon is a pickers dream come true! Do you ever watch any of those shows? This sounds like such a wonderful day! I love discovering new places, and new little towns. Though often I must be content with just discovering places around my city as I don't have a car. But I've always wanted to do a spontaneous road trip like this, where you just go and stop when you want. Arts & Crafts Show at the Santa Fe Plaza.